The Newman Government last week declared Chinese billionaire Tony Fung's Aquis Great Barrier Reef Resort a “coordinated project”, giving it a streamlined approval process to be overseen by the Coordinator General’s office. The $4.2 billion project would include nine luxury hotels, a sports stadium, aquarium, high-end retail outlets, a convention and exhibition centre and a championship golf course. Located 3km south of residential area Yorkeys Knob and 13km north of Cairns CBD, Aquis Resort is expected to increase overall visitation to Australia and, in particular, the tourist-dependent North Queensland. Proposed plans for the project will transform the existing open rural land into a tourist destination comprising 3,750 hotel rooms configured within nine luxury hotel brands, 1,200 centrally managed apartments and 135 centrally managed villas. It also proposes a Convention and Exhibition centre, two 2,500-seat theatre, 18-hole golf course, 25,000 seating sports stadium and 13,500sqm of high-end retail shopping, restaurants, bars and food and beverage outlets. A 13ha reef lagoon, one of the world’s biggest aquariums and a 13ha Water Park are also proposed. The mega-complex is to be built with little scope for impact on the nearby Great Barrier Reef. Aquis Resort at The Great Barrier Reef Pty Ltd (AaGBR) is wholly and solely owned by Mr Tony Fung a Hong Kong-based banking and property tycoon. Mr Fung is a long-term investor in Queensland. "What North Queensland is missing is the man-made wonder of the world,'' said the Initial Advice Statement to the Queensland Government. 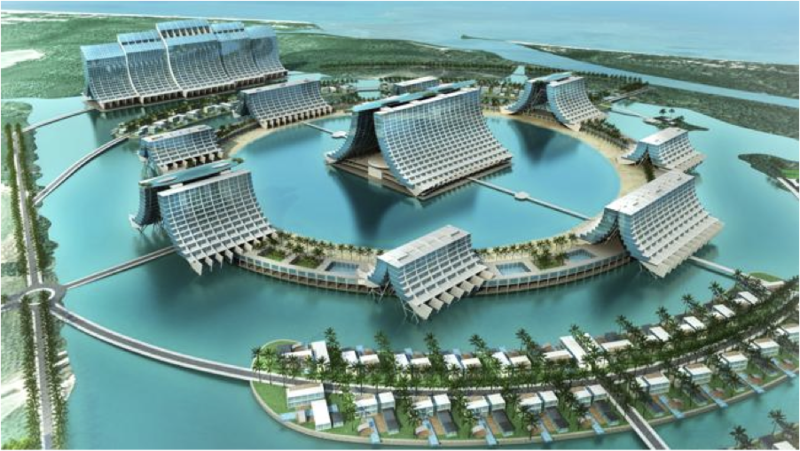 The Aquis project is believe to rival the great man-made structures in Macau, Dubai and Singapore and aims to increase domestic and international tourism to North Queensland. Recent Tourism Research Australia figures show that Australia received 5.7 million overseas visitors in the 12 months to March 31, who spent more than $19 billion. However, only 691,000 visited North Queensland, spending $877 million. The project is set to tap into various markets including weddings, domestic conferences, conventions and other business and event-based occasions. “The need to travel away to see world class acts and exhibitions will be all but negated. Aquis is the unique facility that the local North Queensland community needs and deserves for its social enrichment,” the submission stated. While Aquis is a "mega resort" project the proposed casino is only slightly bigger (in terms of tables and machines) than Crown Melbourne. Aquis is seeking approvals for about 750 tables and 1500 poker machines. "It is accepted that the casino operator at Aquis must pass probity and all other licencing assessment processes, and that a licence will only be granted to a particular operator after a rigorous assessment process,'' the submission said. According to a KPMG report, Aquis will create 16,600 jobs at peak construction (9,300 direct and 7,300 indirect) and 26,700 jobs when fully operational (10,000 direct and 16,700 indirect). Under approvals, building on the 750-acre beachside site would start mid-2014 and be completed by 2018.